On Sept. 17, militants launched the worst attack on a U.S. embassy in a decade, killing 17 people with car bombs, machine gun fire and grenades. It's not the first time an embassy has been used to send a message to (or blackmail) a representative country and sadly, it probably won't be the last. 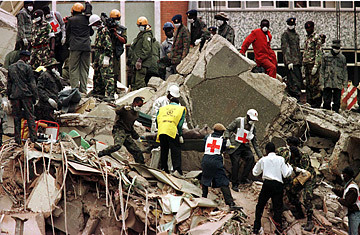 Two nearly simultaneous massive bombs leveled the U.S. embassies in Nairobi, Kenya and Dar es Salaam, Tanzania, killing 224 and wounding thousands. American officials quickly pointed to a then little-known Saudi terrorist named Osama bin Laden. President Bill Clinton vowed to hunt down bin Laden, who was added to the FBI's most wanted list in connection with the bombings. After a trial in New York in the summer of 2001, four of the bombers were convicted of plotting and carrying out the attacks and sentenced to life in prison.